The two biologists haul the ornery package of fat and fur, still penned into the trap that closed around him overnight like a giant clam, up the banks of a meandering, tea-colored stream. The drainage is cluttered with Himalayan blackberry and Japanese knotweed, whose rhubarblike stems the beaver has commandeered to build his lodge—a native mammal thriving amidst invasive plants. The beaver, his lustrous fur shimmering in the pale light, flaps his tail and gnaws at the trap with burnt-orange incisors. His forepaws grasp the wire mesh, a prisoner straining against his cell walls. Although not indigenous themselves, Alves and Bailey relocate beavers under the auspices of the Tulalip Tribes, a sovereign nation with nearly 5,000 members. This week, they’ve set their traps in the Puget Sound suburb of Marysville—half an hour north of Seattle if you leave before daybreak, an eternity at rush hour. Across the street from the Marysville Public Library waits their Silverado pickup, its right two wheels perched on the curb. Alves and Bailey, foreheads damp with sweat, set the beaver down and lower the tailgate. Morning traffic roars past, drivers craning their necks. Running countercurrent to this carnage is another trend: the rise of the beaver believer. Across North America, many scientists and land managers are discovering that, far from being forces of destruction, beavers can serve as agents of water conservation, habitat creation, and stream restoration. In Maryland, ecologists are promoting beaver-built wetlands to filter out agricultural pollutants and improve water quality in the Chesapeake Bay. In North Carolina, biologists are building beaverlike dams to enhance wet meadows for endangered butterflies. In England, conservationists have reintroduced the Eurasian beaver (Castor fiber) in hopes that their pond complexes will attenuate destructive floods. And in Washington, where a century of habitat loss has devastated salmon, the Tulalip Tribes are strategically dispatching beavers to support the fish so integral to their history and culture. That beavers benefit salmon is, in some quarters, a provocative claim. Many biologists historically regarded beaver dams as stream-choking barriers to fish passage. In the 1970s, Washington, Oregon, and California even passed laws mandating the removal of in-stream wood, beaver dams included. More recently, a 2009 proposal funded by the Atlantic Salmon Conservation Foundation suggested eradicating beavers from 10 river systems on Prince Edward Island and employing trappers to enforce “beaver-free zones” in others. The notion of purging beaver dams to allow salmon to pass, however, doesn’t stand up to scientific scrutiny. One 2016 study documented individual salmonids traversing more than 200 beaver dams on their way to spawn in Oregon streams, suggesting that fish have little trouble negotiating the obstacles. Far from harming salmon, in fact, beavers create indispensable fish nurseries. By filling up ponds and digging canals, beavers engineer the deep pools, lazy side channels, and sluggish backwaters that baby salmon need to conserve energy and evade predators such as great blue herons. Today, the National Marine Fisheries Service considers “encouraging formation of beaver dams” vital for recovering Oregon’s endangered coho populations. The joint demise of beavers and salmon also harmed the Pacific Northwest’s indigenous groups—particularly the Tulalip, so bound to the mighty fish that they refer to themselves as People of the Salmon. To the Snohomish, Snoqualmie, Skykomish, and other Puget Sound tribes that compose the modern-day Tulalip, salmon were no mere resources. The fish were partners, symbionts that loyally sustained their human dependents so long as the tribes protected their rivers and treated them with due reverence. The white colonists who overran Puget Sound did not share that respect. On January 22, 1855, Isaac Stevens, the governor of the new Washington Territory, and dozens of tribal chiefs signed the Treaty of Point Elliott, an agreement that forced many of the Sound’s Native people onto the 22,000-acre Tulalip Reservation. While a judge later called the treaty “unfair, unjust, ungenerous, and illegal,” it did have a redeeming feature: permanently preserving tribal members’ rights to fish at their “usual and accustomed” places. Although the provision was seldom honored—Native fishermen were arrested and harassed, sometimes violently, by their white counterparts—a federal court finally intervened on the tribes’ behalf in 1974, granting Native people half the annual harvest. After a stint in Vietnam, Williams returned to Washington to work for a railroad company and attend college via the G.I. Bill. He tried commercial fishing in Puget Sound for a season, netting salmon to sell and flounder to take home. In the early 1980s, some friends asked if he’d consider working for his tribe’s fisheries department—just for a year, they promised. The Tulalip Tribes were then embroiled in legal struggles all over Washington State in defense of their members’ fishing rights, and Williams spent seven days a week on the road, preparing arguments and sitting in on court sessions. A year on staff turned into two, 10, a career. In the decades since, Williams has directed the Environmental Protection Agency’s American Indian Environmental Office, served on the United Nations’ Convention on Biological Diversity, and held a seat on just about every board, council, and commission pertaining to salmon recovery in Puget Sound. “I just got addicted to it,” he laughs. In 2013, Williams found a sympathetic soul in Ben Dittbrenner, the founder of Beavers Northwest, a group dedicated to helping landowners coexist with the meddlesome mammals. Dittbrenner hoped to study the benefits of beaver relocation for his doctoral degree at the University of Washington; now all he needed were some beavers to relocate. The tribe had the desire and the resources, Dittbrenner the beaver expertise. He and Jason Schilling, a tribal biologist, developed a computer model to identify gentle, low-gradient streams ideal for beaver releases, then spent months traipsing the Skykomish River basin, ground-truthing prospective relocation sites. Before the project launched, though, it had to overcome a legal obstacle. The previous year, the state of Washington had passed a bipartisan “Beaver Bill” praising beavers’ ecological value and encouraging their relocation. Although the legislation was well intentioned, it contained a grave flaw, a provision inserted by a beaver-fearing legislator on the Olympic Peninsula. While the law permitted biologists to move beavers around sparsely settled eastern Washington, it prohibited releasing them west of the Cascades—the region that’s home to Seattle, Tacoma, Olympia, and most of the state’s other population centers. The message: Beavers can do good, but keep the damn things away from people. Merely quantifying the impact of released beavers, however, misses the project’s point. 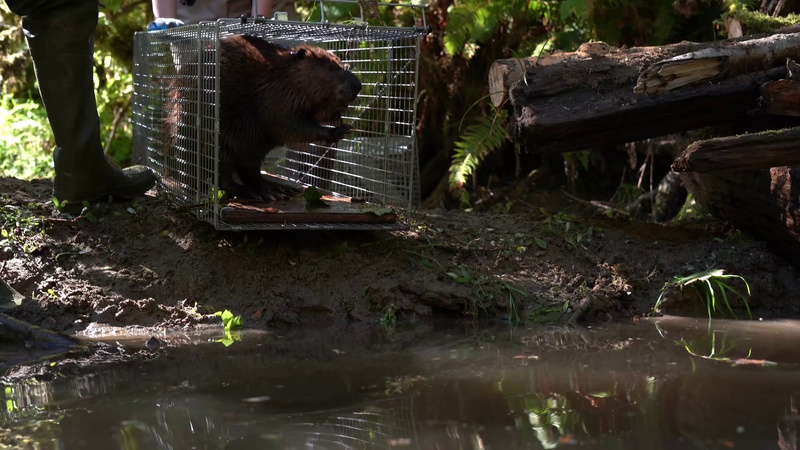 When the Tulalip Tribes began releasing rodents, Dittbrenner’s modeling suggested that around three-quarters of the suitable beaver habitat in the Skykomish was vacant—a gap too large for any relocation effort to fill. Instead, the Tulalip’s hope is to jump-start a natural re-beavering of the Puget Sound’s uplands. The beaver now safely ensconced in the pickup, Alves and Bailey drive back to the nearby Tulalip Reservation to examine their bucktoothed prize. The heart of the Tulalip Beaver Project is the tribe’s fish hatchery, a compound of pools and pens that pumps out 11 million chinook, coho, and chum salmon fry each year. When they’re not holding salmon, the gnaw-proof concrete walls and flowing water within the hatchery’s raceways also make them perfect beaver enclosures. At the hatchery, Alves and Bailey swiftly process their ward. They place the trap on a scale, which registers the creature’s weight at around 30 pounds—a juvenile, Bailey says—snip a hair sample, and staple color-coded tags in the animal’s ears for future identification: white in the left, yellow in the right. Although the biologists handle him as tenderly as possible, the beaver doesn’t enjoy the poking and prodding, and begins to chatter his teeth as though he were cold—another sign of stress. His ordeal mercifully concluded, the beaver is released into one of the raceways, gliding up the narrow pen to huddle against the far wall. A cinder-block hut, floored with wood chips, stands at the raceway’s center. When we return the next morning, we’ll find that he’s settled into the makeshift lodge to await a family reunion. Beavers are kin-oriented creatures, with as many as 10 family members sharing a lodge: the mating adults, their newborn kits, 1-year-olds, and 2-year-olds. (The latter depart the colony each spring in search of their own territories, like college-bound teenagers.) Relocate a beaver by himself and he’s liable to wander the landscape, searching for companionship, until he’s devoured by a bear or cougar. Move him with his clan, and he’s more likely to stay put and build. When all goes well, relocation can produce spectacular results. Later that week, Bailey and Alves drive me to a stream high in the Mt. Baker-Snoqualmie National Forest, the 1.7-million-acre block of Douglas fir and western red cedar that sprawls across the western flank of the Cascade Range. The Tulalip had dropped off a family of seven beavers in this creek in fall 2015. Nothing happened at first, and Alves and Bailey concluded the site was a bust. When they found signs of dam-building the next spring, they figured another colony had moved in on its own. Grainy camera-trap footage, however, revealed that the nocturnal construction workers bore the Tulalip Tribe’s ear tags. The relocation had worked after all. Now a lonely beaver outpost has blossomed into an empire. Eleven separate dams have transformed the stream from a string-straight, free-flowing riffle into a patchwork of sun-dappled pools and serpentine side channels. We teeter along felled trunks and bushwhack through thickets of vine maple, exploring a complex that seems only to expand as we press on. The vast maze of channels and ponds would be an impressive feat for an engineer in a backhoe; for a handful of rodents armed only with incisors, it’s practically miraculous. While expanded ponds are beavers’ most visible hydrologic impact, their ability to recharge groundwater might be an even greater contribution. At the Tulalip’s relocation sites, Ben Dittbrenner has found that for every cubic meter (264 gallons) of surface water that beavers impound, another 2.5 cubic meters (660 gallons) sinks into the earth. As that water trickles through the soil, it cools off, eventually reemerging to mingle with streamflows downriver. Elsewhere, such hyporheic exchange between surface water and groundwater keeps streams hydrated later into the dry season, turning seasonal creeks perennial. Dittbrenner’s research suggests that beaver-facilitated cooling and mixing also reduces water temperatures by more than 2 degrees Celsius (about 3.5 degrees Fahrenheit), a huge boon for heat-sensitive salmon and trout. “This is still a functioning space, and it’s obviously beautiful in a different way,” Alves says as we survey the abandoned kingdom. “It’s eons better than it was when we found it.” Still, there’s no mistaking the disappointment in her voice. Even in the best of times, getting beavers to stay where you put them poses immense challenges. When biologists dumped more than 200 beavers into Wyoming streams in the 1990s, for instance, many fell prey to bears, cougars, and other carnivores. Altogether, fewer than 20 percent took to their new environs. As drought diminishes western Washington’s beaver-carrying capacity, persuading the rodents to stick around has become harder still. To entice the next colony to stay, Bailey and Alves have decided to attempt a new tactic—human-built walls of wooden posts and sticks known as beaver-dam analogues. The idea behind beaver-dam analogues, or BDAs, is simple: In situations where suboptimal habitat discourages beavers from settling down, a human-assisted starter kit can persuade them to stay put and build dams of their own. In one Oregon stream where scientists built more than 120 beaver-dam analogues, beaver activity increased eightfold—and juvenile steelhead trout survival spiked by more than 50 percent. Little wonder that BDAs are now among the American West’s hottest stream-restoration techniques, deployed to enhance wet meadows for greater sage-grouse in Wyoming, remediate mining waste in Montana, and improve fish habitat in Northern California. The appeal of beaver-dam analogues is not merely that they’re effective—they are also easy to install. Armed with sledgehammers, the Tulalip biologists and a few volunteers begin to thwack upright silver-fir logs into the gravel stream bed, pounding them a few inches deeper with each satisfying swing. The hollow thump of hammer meeting wood resounds in the summer air. Between the thuds the crew shouts encouragement. Soon the creek is picketed with two rows of vertical posts, slightly askew, like a mouthful of crooked teeth. Coho fry flit around our boots, picking at insect larvae stirred up by the activity. Mike Sevigny, the Tulalip’s wildlife program manager, plops down on the bank, his shirt darkened by sweat, and pulls off the surgical mask he wears to filter the wildfire haze. While Sevigny spends much of his time managing elk—another creature of vital cultural importance to the tribe—he considers beavers to be the center of terrestrial ecosystems as well as aquatic ones. We return the next day to complete the job. Shayna Schultz and Bethany Tegt, the project’s technicians, thread willow and maple sticks between the posts like basket weavers, then pack the interstices with straw to form a semipermeable seal. Soon knee-deep water has backed up behind the ramshackle dams. The crude structures don’t look durable—they’ll likely blow out in a flood a few springs hence—but permanence isn’t the point. “They just need to last long enough to get beaver back into the system,” Alves explains as we slosh through the nascent pool. By furnishing a safe, attractive pond and a semi-stable base of operations, these beaver-dam analogues will, with luck, convince the next relocated colony to stick around, get to work, and reproduce. Thanks in large measure to the Tulalip’s example, tribal-led beaver restoration in Washington will soon take another leap forward. Among the volunteers at the beaver-dam analogue installation is Erik White, wildlife manager with the Cowlitz Tribe. The Cowlitz’s Southwest Washington territory encompasses the Lewis River, which in turn is home to bull trout, a cold-loving fish imperiled by climate change. Not only have the Tulalip spurred other tribes to action, they have also expended considerable political capital refining the Beaver Bill, the law that prevented relocations in western Washington. Although the Tribe’s unique legal status meant that it was never bound by the prohibition, the law’s illogic irked Terry Williams, the treaty-rights commissioner. More beavers on more Washington rivers would mean more salmon in Puget Sound, he figured. So, in 2017, the tribe flexed its political muscle, dispatching a lobbyist to Olympia, the state’s capital, to advocate for a revision. The stubborn lawmaker who had opposed moving beavers west of the Cascades had retired, and a new Beaver Bill, this one permitting relocations on both sides of the mountains, sailed through. Starting in 2019, nontribal groups, such as environmental nonprofits, will be able to relocate the animals west of the Cascades, too. The doors to re-beavering have been flung open. In early October, I rendezvous once more with the Tulalip crew, this time on a winding forest road that parallels the Snoqualmie River. The summer’s wildfires have been quelled, and the morning is crisp and blue, lit by the sun cresting over the granitic spires of the western Cascades. I arrive in time to catch Schultz and Tegt unloading four wire cages, which between them hold seven hulking beavers. Fourteen beady eyes rove over their captors. The creatures—two adults, four 1- or 2-year-olds, and a skittish kit—were trapped at a golf course near Tulalip, where they’d been irking the groundskeepers. “They all get along pretty well, so we think they’re from the same colony,” Schultz says. Collaborating with beavers, many scientists point out, confers extraordinary benefits: Rodent restoration is a natural, cost-effective strategy capable of tackling problems as diverse as nitrogen pollution and stream erosion. But beaver work can be as frustrating as it is rewarding. No matter how thoughtfully you choose release locations, no matter how many beaver-dam analogues you install, beavers are wont to do what beavers are wont to do. For all the science that guides it, beaver relocation entails, on some level, an act of faith. Dig a wetland with a backhoe, and you can be reasonably certain it will still exist in five years. Outsource the job to beavers, and they might succeed beyond your wildest expectations—or, as at Mahoney, permit your pond to lapse into a meadow. Portions of this story appeared in the book Eager: The Surprising, Secret Life of Beavers and Why They Matter. This post appears courtesy of BioGraphic. BioGraphic is a magazine that focuses on nature and sustainability.